Dr. Samuel Conway, also known as Kagemushi Goro or Uncle Kage (IPA: [kɑ ˈgɛ]), is Chairman of Anthrocon, and regularly attends many other furry conventions. He has been a guest of honor at numerous conventions, both in and out of the furry world, including Albany Anthrocon, Feral! 2001, ConClave, Duckon, Eurofurence 8 (2002), I-CON, MiDFur X (2008), ConFuzzled 2011, Furlaxation 2012, Philippine Anthro Festival 2014, Fur Reality 2015, and Arizona Fur Con 2015. He holds a doctorate in chemistry from Dartmouth College, and is a professional research scientist. Uncle Kage's name is actually an abbreviation of Kagemushi Goro, or the Samurai Cockroach, his selected fursona (kage mushi is Japanese for shadow bug; this is in turn a pun on the Japanese term kagemusha). In 2001, Uncle Kage went incognito to Mephit Furmeet 5 as "The Unknown Furry", wearing a cheaply-designed fursuit, including a mask made from a paper bag. Kage was introduced to furry fandom by Jim Groat at Noreascon in 1989. He became a regular of FurryMUCK in 1991 and still spends time there in the evenings. 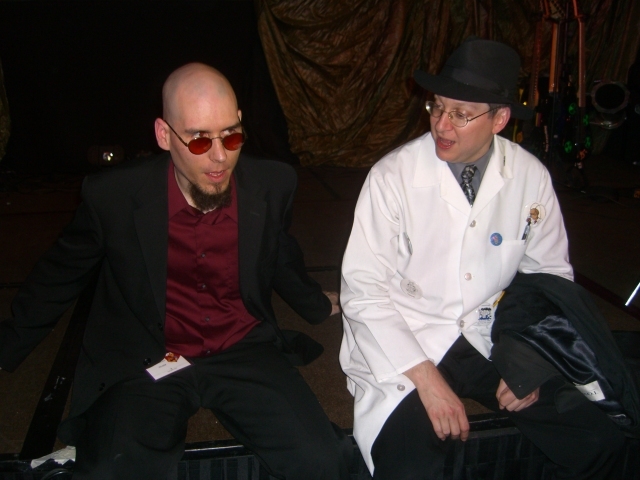 Uncle Kage has been the chairman of Anthrocon since 1999, after his invitation as a guest of honor in 1998. Under his leadership, Anthrocon was incorporated and moved from Albany to Philadelphia, where the convention tripled its attendance in a period of 7 years. Kage remains the public liaison for Anthrocon, handling such things as public relations, hotel contracts, finances and even damage control, as well as many numerous other activities before, during and after the convention. As the chairman of Anthrocon, Uncle Kage has a distinct hatred of Target since they purchased and closed the Adam's Mark Hotel in Philadelphia in late 2004, forcing Anthrocon's move to Pittsburgh in 2006 and making him find a backup hotel for 2005. This hatred was demonstrated at Megaplex 5 when, visiting 2, The Ranting Gryphon, in the Dealer's Den, he received a package of sandwich crackers; upon hearing they were Target brand, he pulverized the crackers within with repeated karate chops in an uncharacteristic show of rage. I cannot help but be irked at the way some of these ideas are presented, especially when they are offered by people who have (a) never seen the hotel and (b) never run a convention, who scoff and say, "I see no reason why we can't...." I call these people "armchair conchairs." They are experts in running a convention, even though they've never done it, and they know every inch of the hotel even though they've never been there, and in some cases, have never even looked at the hotel's floorplans. They are the first ones to run to the newsgroups and proclaim, "It would have been better if only they had done it my way!" Uncle Kage is well known for his storytelling, always told with a glass of wine in hand, often based on everyday experiences - Uncle Kage's Story Hour is a popular addition to the schedule whenever he is present at an event. The Story Hour often involves a few humorous anecdotes from his own personal experiences. His stage name was the result of his first storytelling experience at ConFurence in 1994, and is a derivative of his fandom name Kagemushi Goro. He is regularly invited to tell his stories as a guest of honor at other conventions, both within and without the furry fandom, including I-CON, Eurofurence, ConClave, and Camp Feral!. Gross sales from recordings of his Story Hours were over US$2600 in 2004; no profit was realized, as the intention was to increase membership and awareness of Anthrocon. He has also published several short stories under his proper name of Dr. Samuel Conway. Most of these were in titles printed by Sofawolf Press, although his best-known work Tweaked in the Head can be found in the anthology Flights of Fantasy, edited by Mercedes Lackey (Daw Books, 1999). Uncle Kage also manages to make charity auctions fun, to the detriment of the wallets of many con-goers. Sometimes co-auctioneering with 2, the Ranting Gryphon, Uncle Kage is very rarely seen auctioneering without his trademark glass of wine, although he has been known to exchange it for water (or Japanese sake) on occasion. He also is known to express displeasure at people who bid in multiples less than five. One of his most famous auctions was the sale of the "last brick" from the recently demolished Adam's Mark Hotel in 2006. Even lesser known to the fandom is the fact that Uncle Kage used to wear the fursuit of Chester Ringtail incognito in early 2000, which he admitted around 2009-2010 on a few occasions, in particular, at MFF 2010. ↑ Uncle Kage: Why A Cockroach?